Do you know what's in the play makeup your children are using? Just last year in the USA, there have been reports about traces of asbestos in children's play makeup. If you're shopping for budget makeup in a toy store, chances are that not a lot of thought has been given to the safety of all of the ingredients. 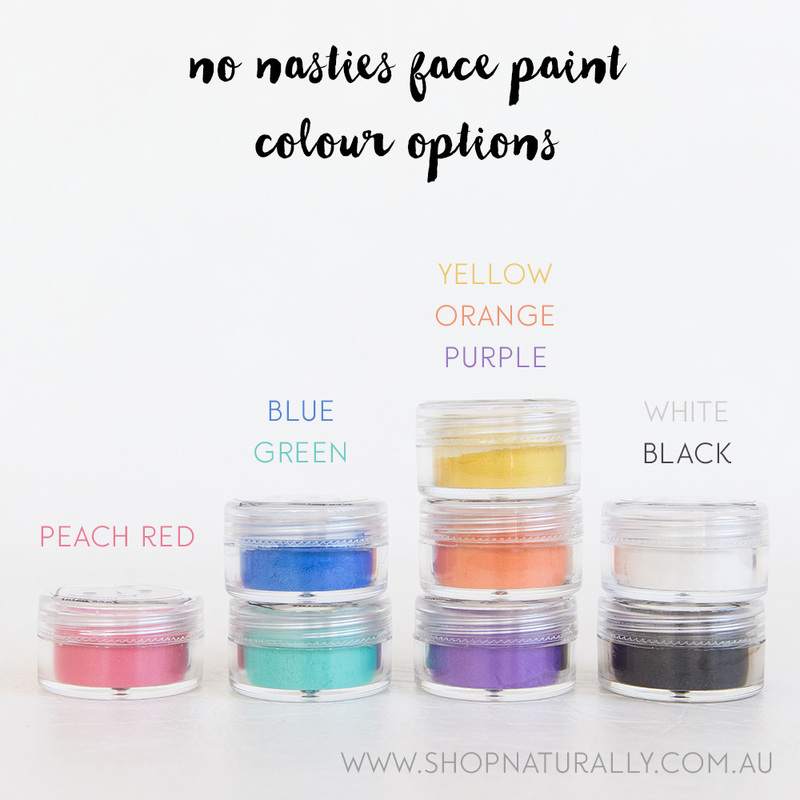 No Nasties is an Australian brand using only natural and mineral ingredients to make a range of play makeup for your little one and this week we have also introduced their face paint back in to store. The face paint packs contain paint in the form of coloured powder. To apply, use the art palette provided and a little water or oil to mix the coloured mineral powder in to a liquid and then paint away. This powder is completely safe and natural as long as the powder is not inhaled in its powder form, which is a statement that can be made about all natural makeup in powder form, whether it be foundation, bronzer, highlighter, setting powder or more, including high end brands made for adults. Your pack contains 3 of the colours above (selected at random) along with a shimmer balm, applicator sponges and brushes, an art palette with 4 holes for mixing and a sheet of temporary tattoos. What else is available in the No Nasties range? Kids makeup was the very first range of products for this brand, available in 3 colour ways (Pink, Purple and Turquoise) in 2 different size packs. Along with these original products, a water based peelable nail polish joined the ranks in late 2018, just before Christmas, available in pink and purple. New to the range in late 2018 too is the SLiCK KiDS hair and body care range. There very little in the market today in the way of natural hair styling products for kids. With a natural hair spray, hair gel and hair paste in the range, they are joined by a detanger, a hair & body wash and a biodegradable tail comb for helping with dividing hair for plaits.